Degree-day benchmarks indicate discrete biological events in the development of insect pests. 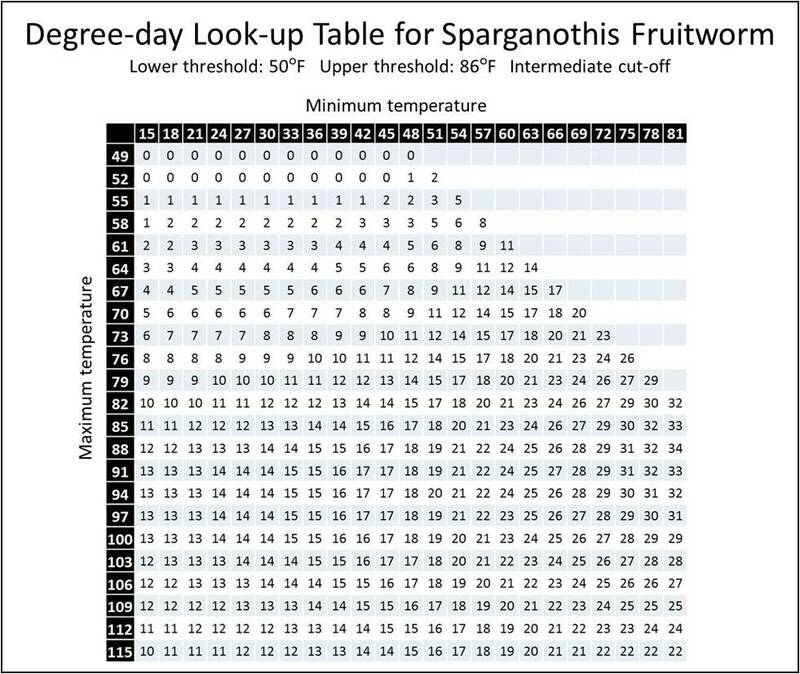 For the Sparganothis fruitworm, recent studies conducted by Dr. Shawn Steffan (USDA-ARS/University of Wisconsin-Madison), Annie Deutsch (University of Wisconsin-Madison), and Cesar Rodriguez-Saona (Rutgers University) have isolated the key development events and linked them to degree-day (DD) accumulations. These degree-day accumulations can improve treatment timings for cranberry IPM programs in spring and summer. Growers simply need to keep track of their own daily maximum and minimum temperatures on the bog. 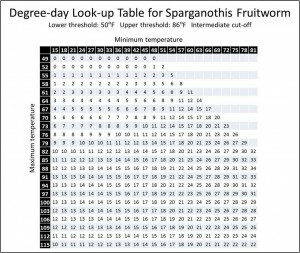 With these maximum and minimum temperatures, the handy “Degree-day Look-up Table for Sparganothis Fruitworm” can be used to determine the daily accrual of degree-days. The minimum temperature on a given day (horizontal bar in the look-up table) will intersect with a maximum temperature (vertical bar in the look-up table) for that day. Where these intersect, there is a DD value. This value is the DD accrual for that day. Growers can keep a running total of these DDs for their bogs, and when the running totals reach certain benchmarks (see yellow table below), the grower will know the current developmental status of the Sparganothis population on their bog. All degree-day accumulations begin on March 1st, and from this point forward, the male flight can be expected to start around 596 DD. The females can be expected to lay the first eggs of the generation by 681 DD. The male flight should be half over by 884 DD. 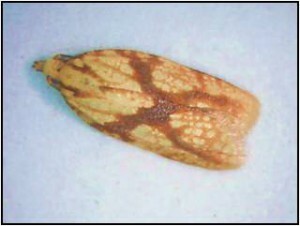 The first caterpillars can be expected to hatch out by 895 DD, and this will continue through 1,890 DD. 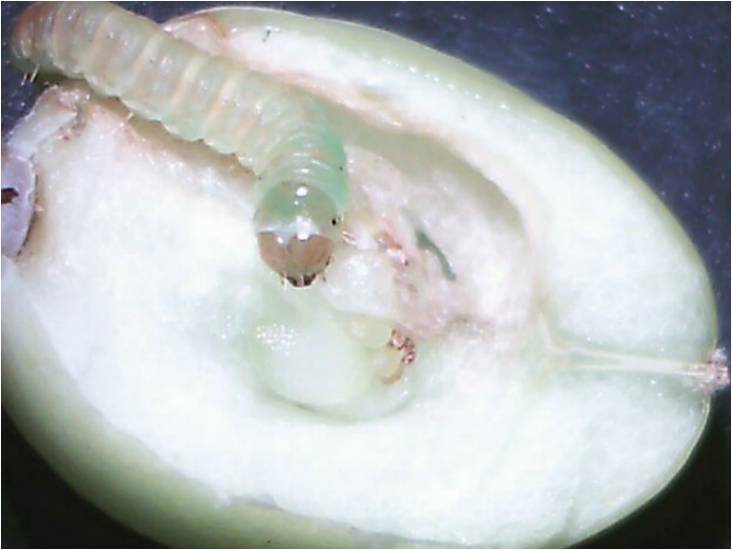 With these key benchmarks, growers can plan to time their pest control tactics to hit adults, eggs, or caterpillars.